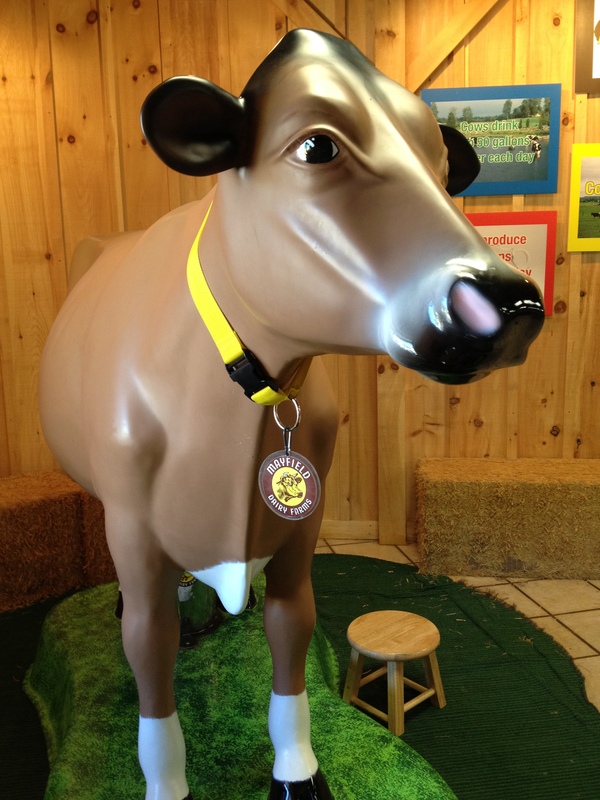 Cool Off 2012: Mayfield Dairy Farm | Oh, the Places We See . . .
Ayden’s favorite flavor? Chocolate, of course! Ask almost anyone from Knoxville to Athens what color jug to look for if you want Mayfield’s milk, and they’ll answer YELLOW! It’s the same with ice cream cartons, frozen novelties, even campaign posters for Mayfield Dairy Farm president Scottie Mayfield who’s running for Congress! Mayfield is a brand we know and love — not just for building strong bones and cooling us off in this brutal summer heat but also for an iconic brand that we’ve grown up with in school cafeterias and grocery stores throughout East Tennessee. So, for my fifth in a series of Cool Off 2012 blogs, I ventured to Mayfield Dairy Farm in Athens where I watched kids on a summertime field trip and then toured the Visitor Center. Afterwards, I treated myself to a cold, creamy cup of my favorite flavor! It was 1910 when T. B. Mayfield bought 45 Jersey cows and delivered milk to people in his hometown of Athens, Tennessee. Today, Mayfield milk is distributed in Tennessee, North and South Carolina, Alabama, Georgia, and Florida. 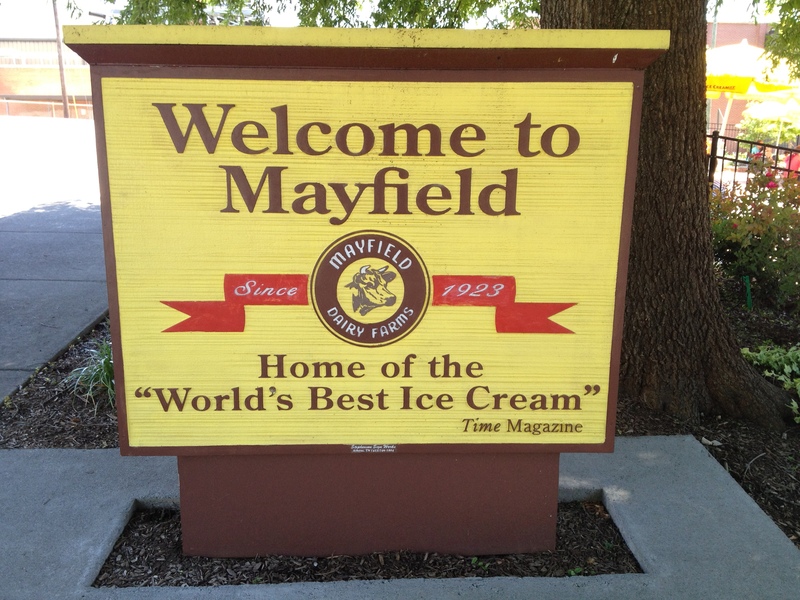 In 1981, Time named Mayfield’s the “World’s Best Ice Cream”! 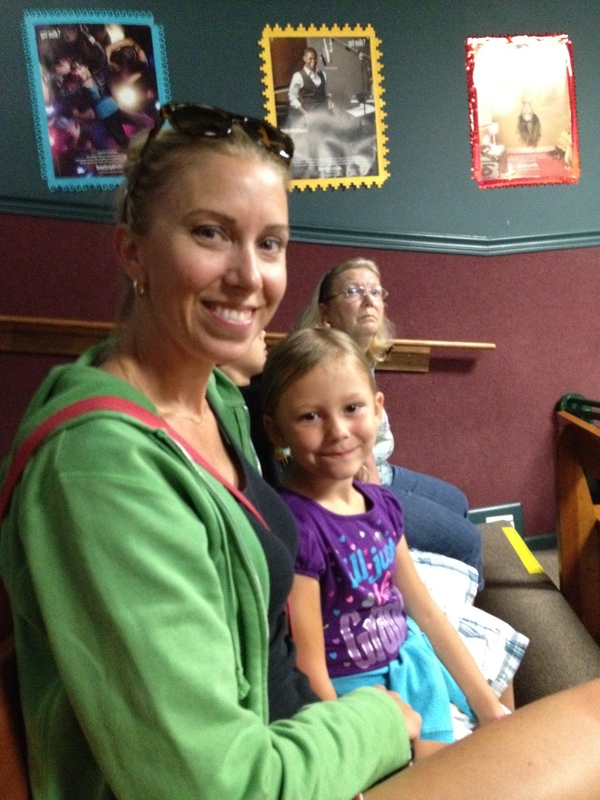 A mom and daughter from Fairfax, Virginia, wait for the Mayfield tour to begin. But not much of that mattered to the more than 100 kids I saw on the Factory Tour, ready to see how a real dairy works. 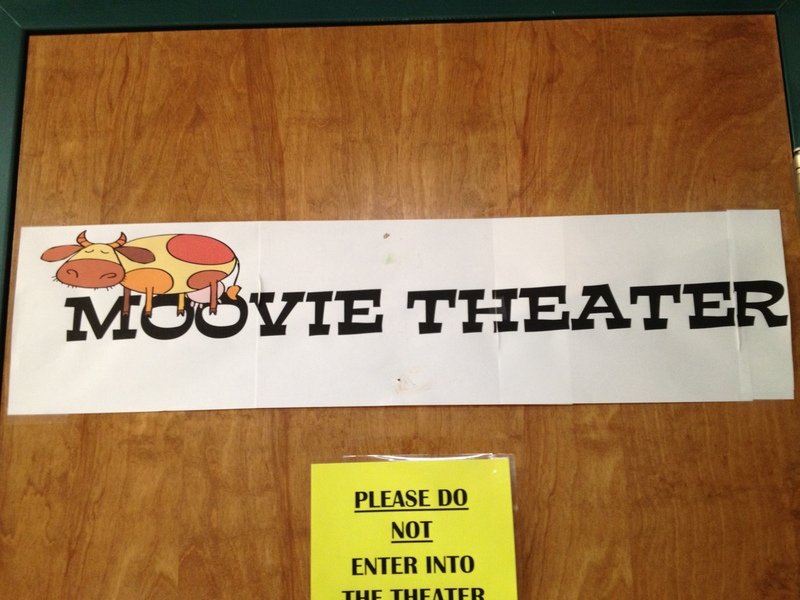 We first went into the Moovie Theater where films are sometimes shown, but not today. Instead, we did a little meet and greet and got to know our guide better. Since we couldn’t take pictures inside the processing areas, you’ll have to take my word for it: fascinating! 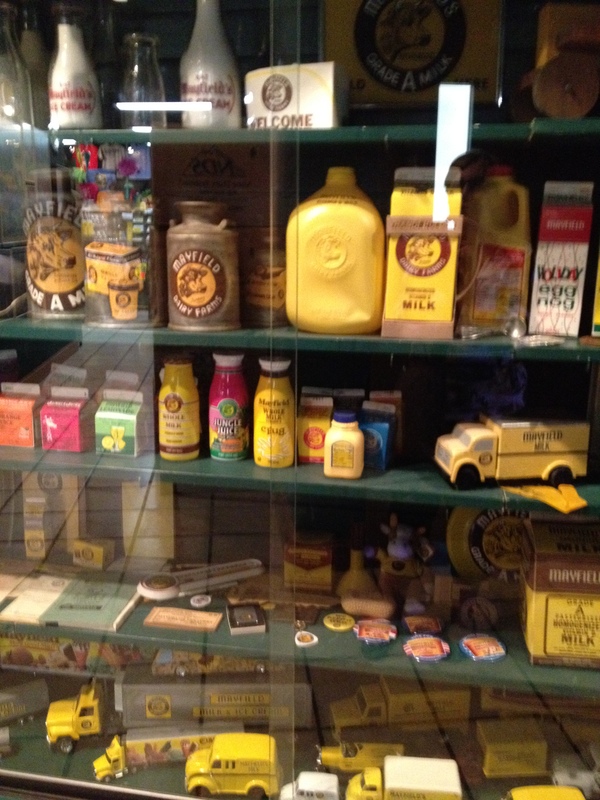 First, we watched as rows of yellow jugs were created from bits of plastic, melted and molded into shape. Then, the machines punched out the tops and handles, dumping the scraps into a bin to use later to make more jugs. (Ultimate recycling!) The third area — the filling room — featured parading jugs ready, willing, and able to receive delicious Mayfield milk. The jugs then moved on to be capped and stored. Last, we viewed the clean-up area and the section of the plant where pint and half-pint cartons are filled. When school’s in session, Mayfield’s can fill two million half-pint cartons of milk each week! Where is all this milk coming from? 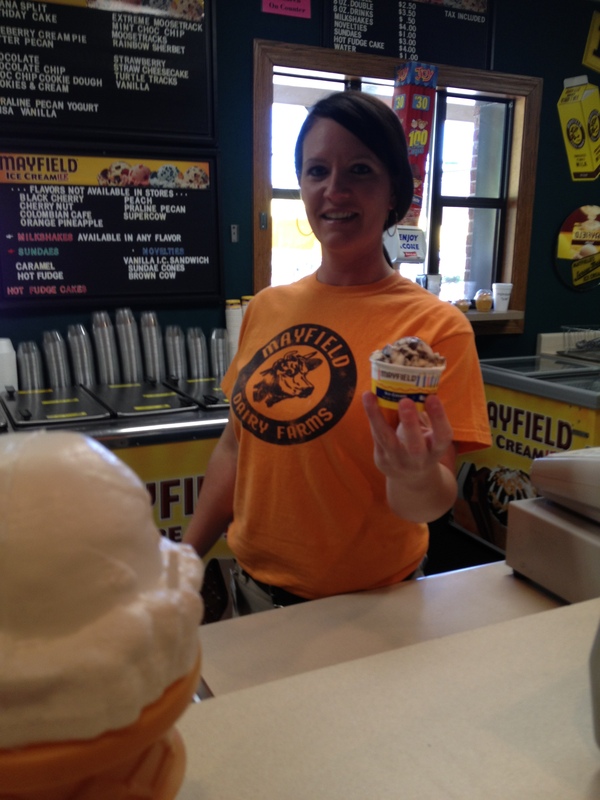 Mayfield’s receives over 120,000 gallons of milk a day (weekends, too!) from over 150 area farmers! 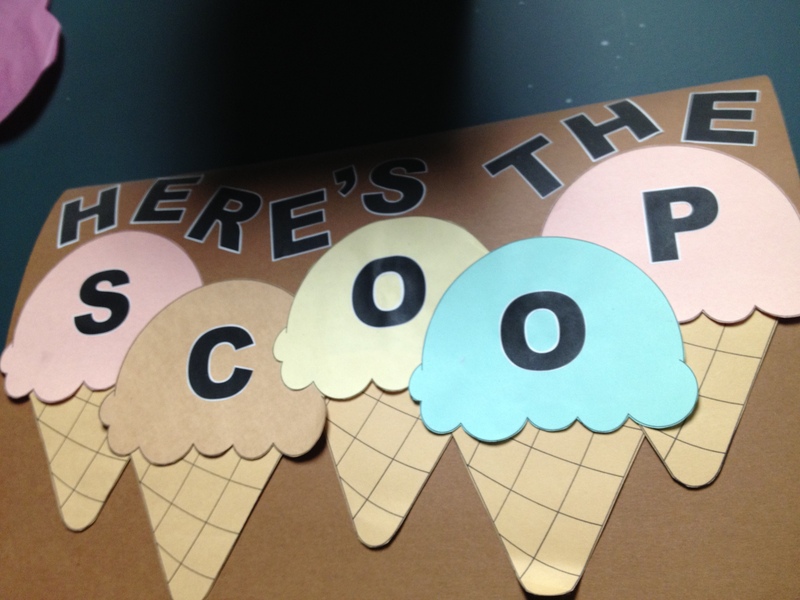 You can’t tour the ice cream factory yet, but in the near future that part of the dairy will be open, too. 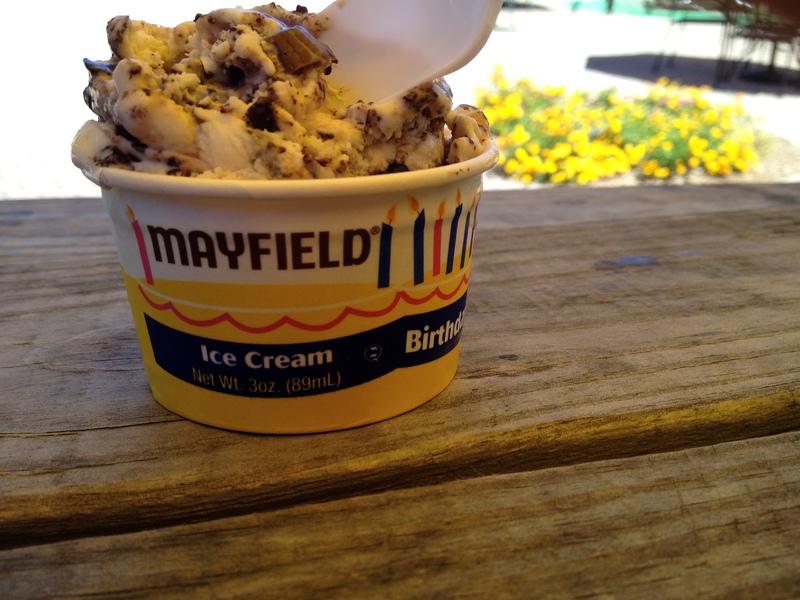 We learned a lot about Mayfield ice cream from watching a video and listening to our guide. I’m going to wait ’til the end to tell you the best-selling flavors she named for us, but be thinking now. I want to see if you can guess which one is Number One! She’s serving my favorite flavor? Can you guess what it is? 50,000 gallons of ice cream per day! 10,000 ice cream sandwiches per hour! 9600 sundae cones per hour! 11,500 Brown Cows per hour! 3600 pint containers per hour! 3600 48-ounce and 56-ounce containers per hour! 400 three-gallon tubs per hour! When Mayfield technicians first pour ice cream that has never been frozen (still in soft serve stage) into the cartons, they quickly place it into freezers at 45 degrees below zero where it hardens in 90 minutes! Then, the ice cream is moved to freezers set at 20 degrees below. A lot of work to keep that ice cream creamy and cold! We left the Factory Tour ready to look around and, of course, sample the goods. 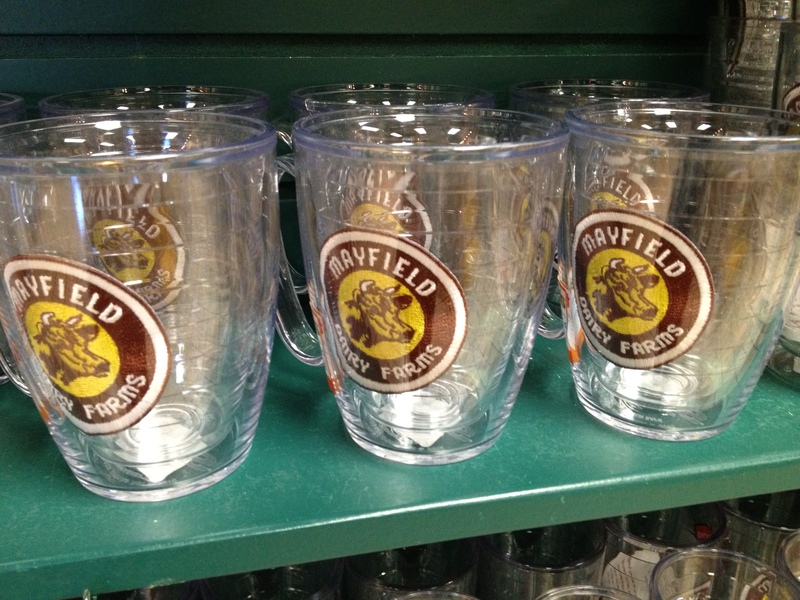 The Mayfield Gift Shop offers almost everything bovine you can think of like udder bowls and spoons and cow-shaped scoops. 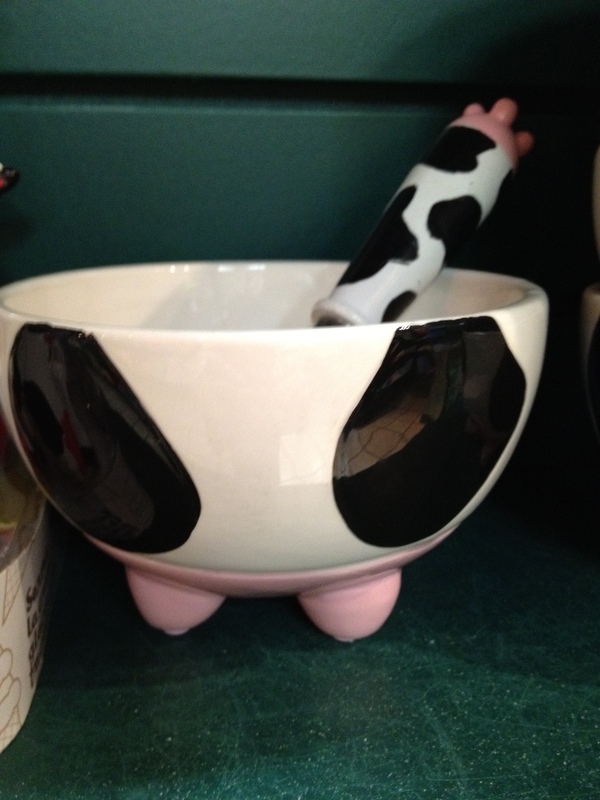 An Udder Bowl and an Udder Spoon! 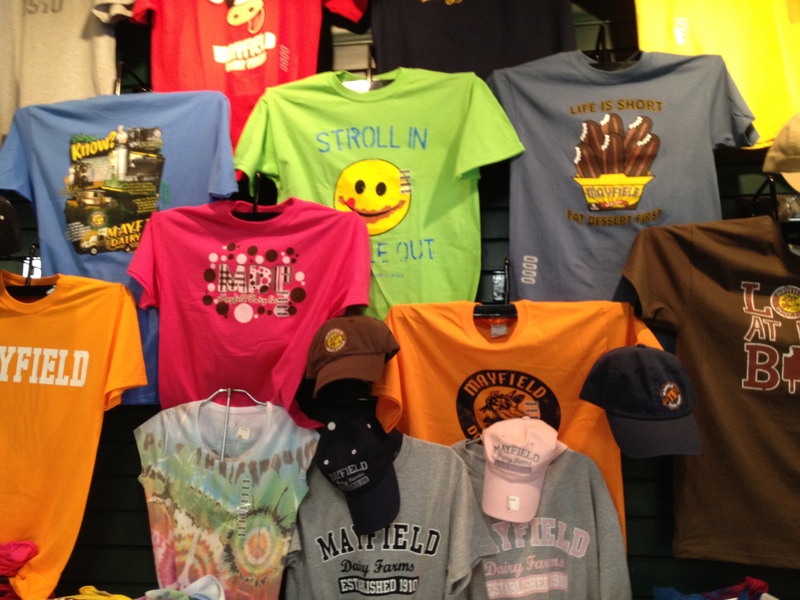 And t-shirts with slogans like “Love at First Bite” and Mayfield branded items! The real treat, of course, is the ice cream. 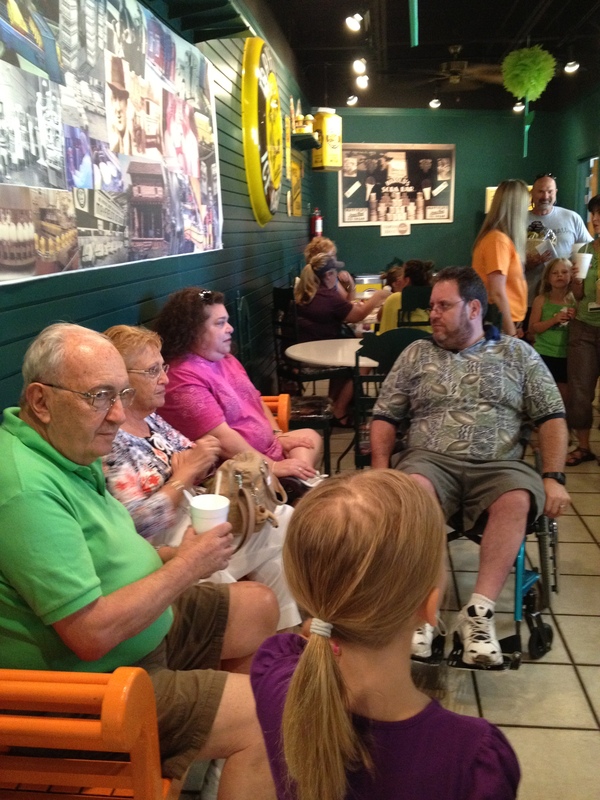 Young and old file into the dining area to order their favorites. 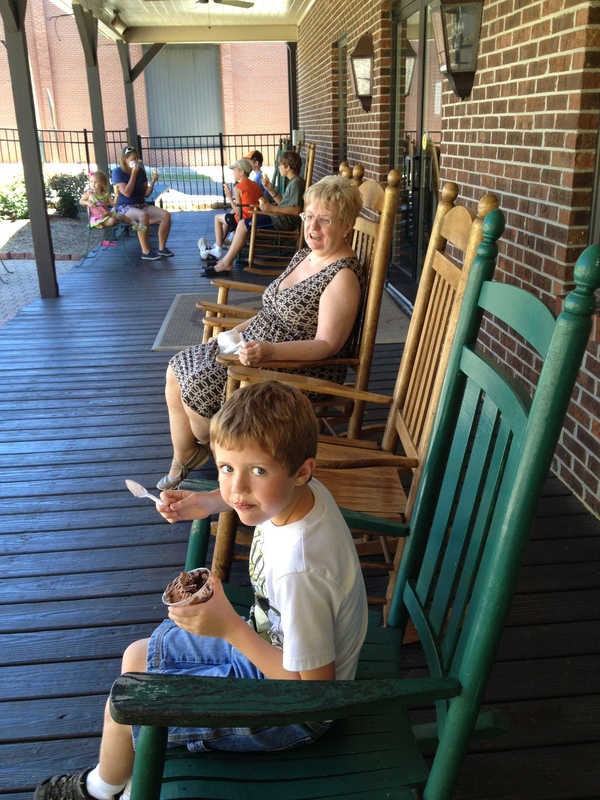 Outside, these big porch rockers don’t stay empty for long — lots of folks want that Southern experience — rockin’ on the porch with a cup of Mayfield’s ice cream! So, have you guessed the best-selling flavors yet? Just look below this picture of Jordan Hope and Jillian Boreing for the answer. They confirmed what I suspected. 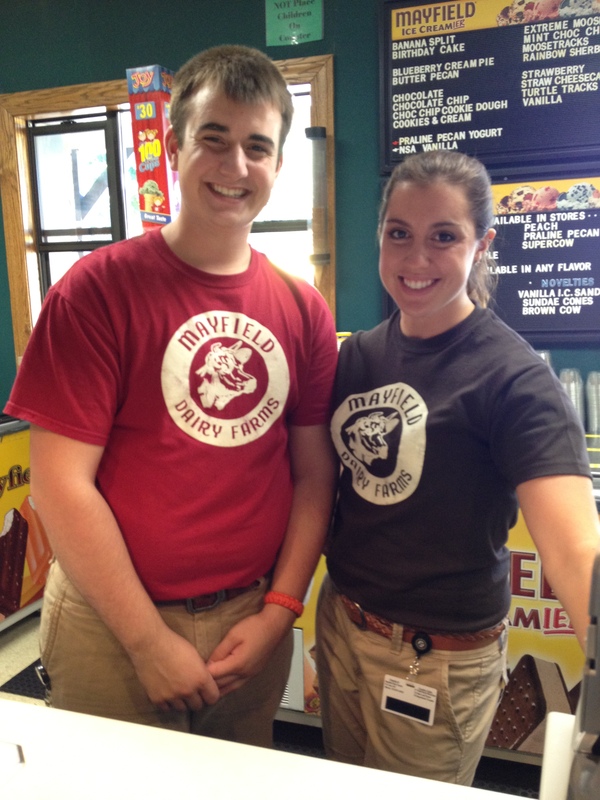 Jordan and Jillian – great Mayfield scoopers! Now, for those of you who haven’t had Moose Tracks, here’s how Jordan described it: Vanilla ice cream base with Denali fudge swirl and chunks of chocolate cups filled with peanut butter! Yum! I had to order that one, for sure! A cup of Moose Tracks makes my day! If you’re thinking of going to Mayfield Dairy Farm to cool off OR take your relatives OR herd a group of cute kids through the process, go to the website to confirm this schedule: Monday -Friday: 9 AM to 5 PM and Saturday: 9 AM to 2 PM. Closed on Sunday. Or call 1-800-MAYFIELD. 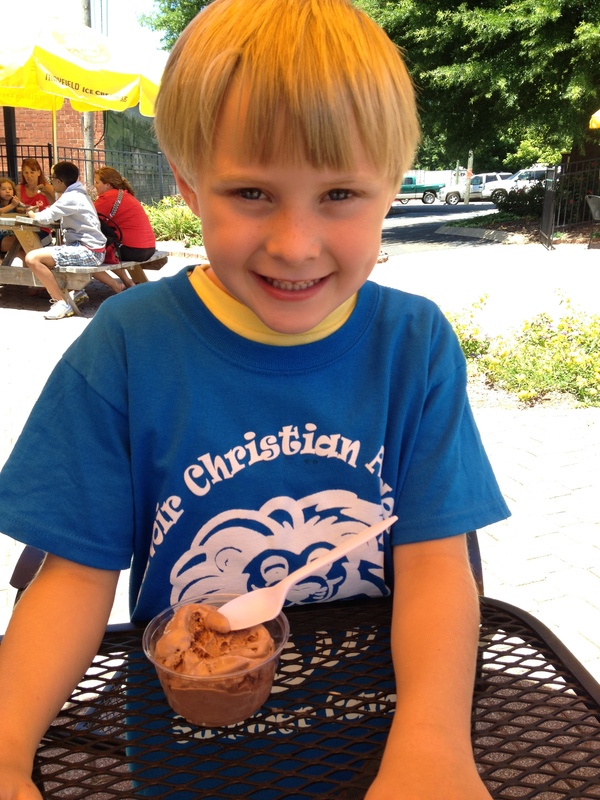 Delicious ice cream, shakes, and other goodies served with a smile! It’s a great place to cool off! Mayfield Dairy Farm is a point of interest on the Tanasi Trail of Tennessee Highways and Byways. Note: If you’re making a day of it with kids, you might consider going to Sweetwater Valley Farms (17988 West Lee Highway, Philadelphia, TN) to see a working farm and cheese production on the same day as your visit to Mayfield’s. The two sites are approximately 25 miles apart. You’ll love ’em both! 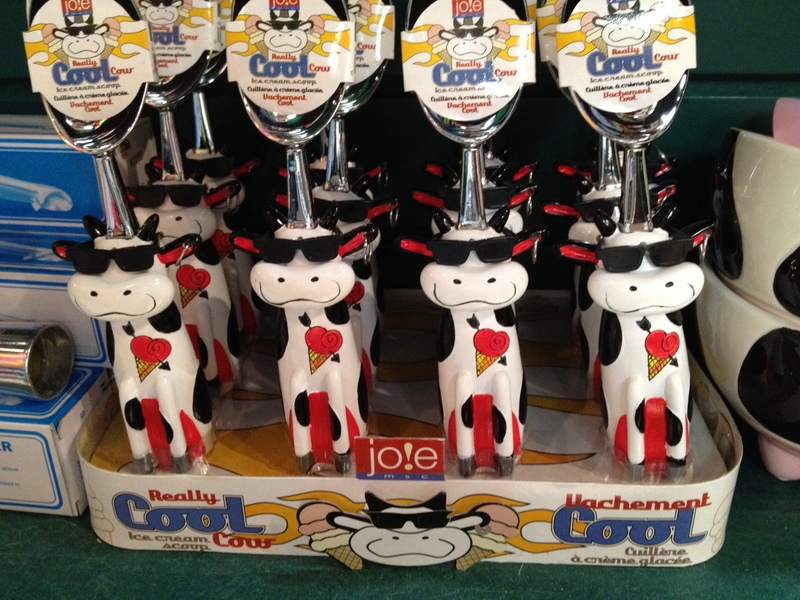 Four other Cool Off 2012 blogs await you — hope you’ll take a look: Original Freezo, Coolato Gelato, Bruster’s, and Razzleberry’s. And there’ll be one more. Or maybe two. It’s a hot summer, after all. 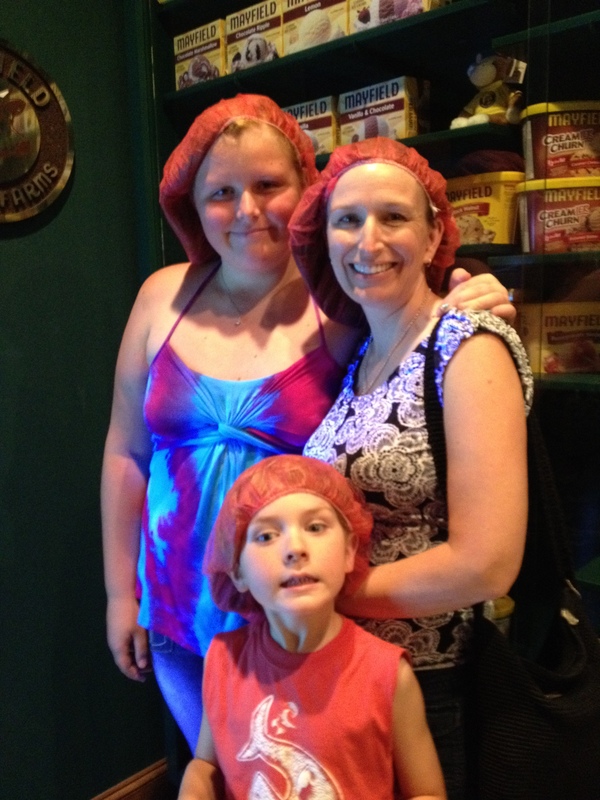 This entry was posted in Destination, Tennessee and tagged Cool Off, field trip, gift shop, ice cream, tour. Bookmark the permalink. Not sure where you can purchase those flavors. If you want to see what’s currently being offered at Mayfield’s, go to their website (http://www.mayfielddairy.com/) and click on Products, then Ice Cream. There are a couple of categories that list flavors. Thanks for asking! wow. great. I would love to visit this place. Thanks for reading and commenting. We took our granddaughter for her third visit yesterday. Although she has outgrown the cow and some of the Wow! features she used to love, she still had fun with that ice cream!